Excise Duty is a duty on manufacture of goods in India. All goods???.... Not all goods…. Only exciseable goods. >> Goods specified in first and second schedule to CETA,1985 as being subject to a rate of duty. >>Therefore, in order to be exciseable…. Goods must be specified in CETA + They must be subject to a rate of duty. Conditions for levy of Excise. >>Such manufacture should take place in India. >>Such manufacture must result in Goods. >>Such goods should be exciseable. Goods manufactured in the State of Jammu & Kashmir, specified in CETA and subject to a rate of duty…. Are such goods exciseable? YES. The Central Excise Act, 1944 extends to the whole of India including the State of Jammu & Kashmir… [Vide enactment of TAXATION LAWS (extension to Jammu & Kashmir) Act. Exciseable goods manufactured in SEZ…. Is excise duty payable on such goods???? NO. SEZs are exclusively excluded from the definition of India for all taxation purposes. Exciseable goods manufactured in 100% EOU…. Is excise duty payable on such manufacture???? 100% Export Oriented Units(EOUs) are set up to promote exports and the goods manufactured by such units are not leviable to excise normally. However, if such EOUs clear their goods in INDIA(also called the Domestic Tariff Area) they are liable to pay excise duty. Certain goods are mentioned in CETA. However, no rate is specified against them i.e. Rate column is left blank. Are such goods exciseable? As set forth by Sec 2(d) of the Central Excise Act 1944, Exciseable goods refer to goods specified in CETA as being subject to a rate of duty. Therefore mere mention is not enough for the goods to be exciseable…. They must also be subject to a rate of duty. Since in the given case no rate has been given, therefore such goods are not exciseable. Certain goods are mentioned in CETA with rate of duty against them being NIL…. Are such goods exciseable??? YES. Since NIL rate of duty is also a rate of duty. >>Goods to be exciseable must be specified in CETA….. Therefore if certain goods are not mentioned in CETA are non-exciseable. >>Goods specified in CETA must also be subject to a duty of excise. In other words, goods mentioned in CETA must also have a rate of duty applicable to them… Therefore if the rate column is left blank in respect of certain goods, these goods are also not exciseable even though the goods have found mention in CETA. Is Waste/Scrap also liable for Excise?? Yes, if waste/scrap produced during a manufacturing process is movable, marketable and specified in CETA as being subject to rate of duty. >> Waste/Scrap produced during manufacture of exempted goods is also exempt from levy & payment of duty. >>Waste/Scrap produced due to any non-manufacturing process like repair is not liable to Excise Duty. Taxable Event refers to the event, the happening of which triggers the levy of excise duty. In other words, Taxable Event means the event that results into tax consequence for the party that executes the event. In the context of Excise, Taxable event is manufacture of Exciseable goods. Though excise duty is levied on manufacture of goods, it is collected on removal of goods from factory for administrative convenience. What is Clandestine removal of goods? Removal of exciseable goods from factory without invoice in order to evade excise duty is called CLANDESTINE REMOVAL of goods. Such goods are called NON-DUTY PAID GOODS. Such removal may attract penalty and other consequences under the Act besides levy of Excise. Is manufacture of Alcohol and Wine liable to Central Excise Duty? Levy of Excise Duty on manufacture of Alcoholic Liquors for human consumption is a State Subject and hence such manufacture is not liable to Central Excise. Such manufacture is exclusively excluded by Entry no. 84 of the Union List and is covered by Entry no. 54 of the State List. Is manufacture of medicinal and cosmetic products containing alcohol liable to Central Excise Duty?? Yes. Such manufacture is covered by Entry 84 of the union list. Certain product is manufactured in a notified designated area at 210 nautical miles from the Indian Landmass. Is such manufacture liable to Central Excise Duty? No. The Central Excise Act extends to notified designated areas within 200 nautical miles from the Indian Landmass. Salt is manufactured by the State Govt. Is such manufacture liable to Central Excise Duty? With regard to levy of Central Excise Duty, no distinction is made between goods manufactured by or on behalf of Govt. and goods manufactured by others. However, if salt is manufactured by or on behalf of govt. excise duty is not leviable. Is repairing, reconditioning or remaking liable to Central Excise Duty? No. Since these processes do not lead to the emergence of a new product. Labeling, re-labeling of Unit Containers of Chocolate, does that attract levy of Excise Duty? Chocolate is covered under Third Schedule (RSP-Based Valuation). As labeling/re-labeling of goods specified in Third Schedule amounts to manufacture as per Sec 2(f) (iii) of the Central Excise Act 1944, labeling/relabeling of unit containers of Chocolate attracts levy of Central Excise Duty. Does manufacture of Parts used for repair or replacement during warranty period attract levy of Central Excise Duty??? Yes. 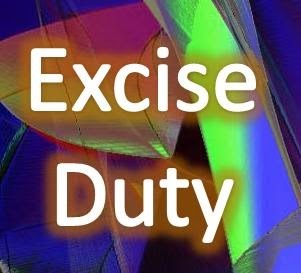 Excise duty is a duty on manufacture of goods. It is of no importance whether the goods are sold, captively consumed, distributed as free samples or used in repair/replacement during warranty period.